Over the weekend, a photo of out-of-work web developer went viral, resulting in a flurry of job offers. 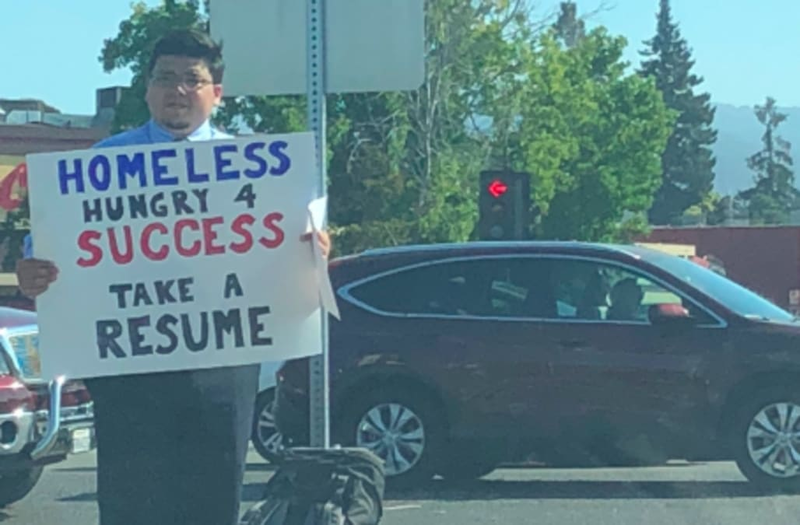 The photo, which was tweeted by @jaysc0 on Friday, showed David Casarez standing on the side of the road in Mountain View, California, holding a placard telling people that he was homeless. Despite his circumstances, Casarez didn't ask for money, instead asking people to take copies of his resume. A college graduate, Casarez told NBC Bay Area that he had moved to Silicon Valley last September with three years' experience as a software developer, with the goal of launching a startup. Those dreams faded when Casarez underestimated the cost of living in the area, and the difficulties of finding work. He stayed in his van, until that was taken in June when he couldn't afford the payments, leaving him sleeping in a park. "All I wanted was for one person to notice, take my resume and give me an opportunity," he told the news outlet. The photo amassed tens of thousands of retweets, resulting in offers of jobs and help. On Sunday, Casarez thanked everyone for their support. The situation is indicative of the affordable housing crisis which has engulfed Silicon Valley and neighbouring San Francisco. Even family of four earning $117,400 per year in San Francisco, Marin and San Mateo counties is considered "low income," and is eligible for affordable housing programs. It's also why big tech companies like Facebook and Google have looked to building housing for their employees, who too struggle with the cost of living.